Google+ Rawfully Tempting™: Zippy Veggie Wraps With Taco Nut "Meat"
Zippy Veggie Wraps With Taco Nut "Meat"
I love being able to take an SAD (Standard American Diet) meal that W enjoys and turn it into a RAW recipe that he absolutely loves! Woohoo! Success tonight! We both feel soooo much more energized after eating live food than we ever felt with cooked food. No more heavy, full feeling after meals. I used variations from 3 different recipes for this delicious dish. You have to let the veggies marinate ahead of time, but the recipes are all super quick and easy to prepare! For the Spicy Taco "Meat"
Process almonds and walnuts into a powder. Place nut meal into a mixing bowl. This will keep 4 days in the fridge. You could double this recipe, but I found this enough for 2 without too much leftover. 1. Combine marinade ingredients in bowl. 4. Serve over collard greens, kelp or zucchini noodles, or taco shells. In a food processor, pulse ingredients (using short quick pulses) into small pieces. Do not puree! 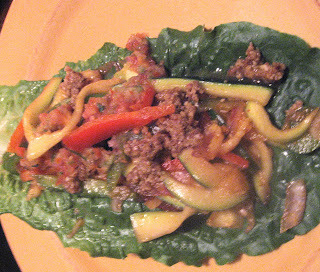 Serve: Spread Spicy Taco "Meat" and marinated veggies, and top with Salsa on romaine lettuce leaves, soft taco shells, or spiralized zucchini. Enjoy!